Q. Antonius Balbus was a member of the Marian party, and in 82 BC was appointed praetor of Sardinia. Before leaving for Sardinia a denarius was struck by order of the Senate. At the time the senate was dominated by members of the Marian party. 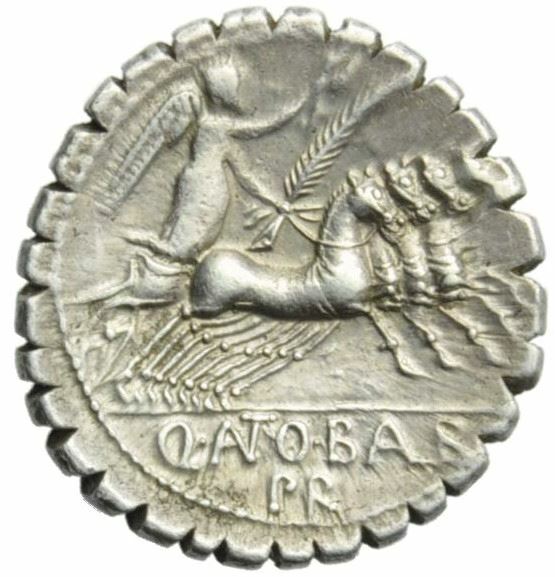 The denarius was produced to pay the army preparing to resist the return of Sulla. The reverse imagery reflects the expectations of the senate and of Q. Antonius Balbus. Unfortunately for Balbus, Sulla was victorius in the battle of the Colline gate. Q. Antonius Balbus was removed from his position as praetor by L. Philippus and killed.